The proposal is an ode to the summit of passion for plants, to all who explored the world of plants since the dawn of time, to the true collectors: the Plant Hunters. The Plant Hunters were not just botanists, they were adventurers and explorers. They had to be tough to survive the conditions they faced in far-flung corners of the world. 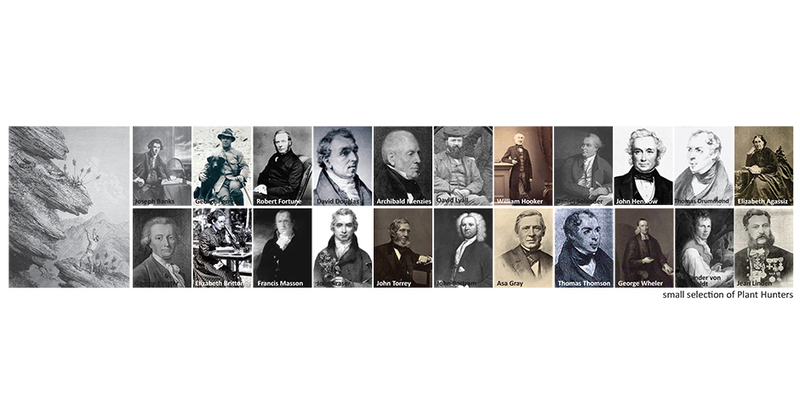 They survived shipwrecks, sieges and slavery and battled with pirates. This garden is the collection of symbolic plants introduced in Europe by the real Plant Hunters. 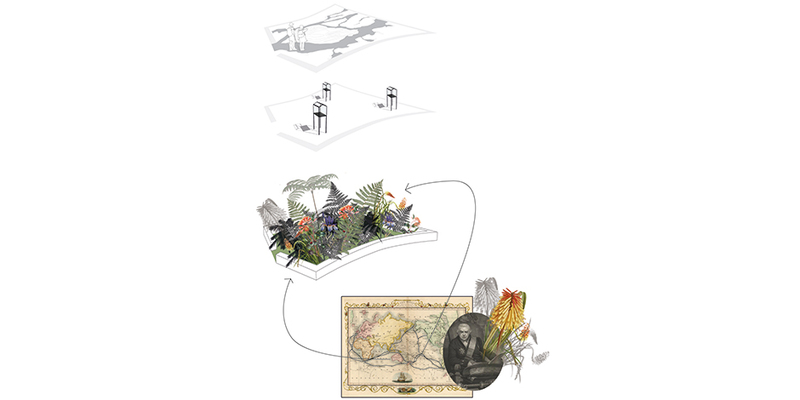 With this Planthunters garden we want to recreate the exciting and adventurous world in which the Plant Hunters travelled in discovering new and unusual plants. Visitors should feel in a totally different landscape which they themselves can explore. 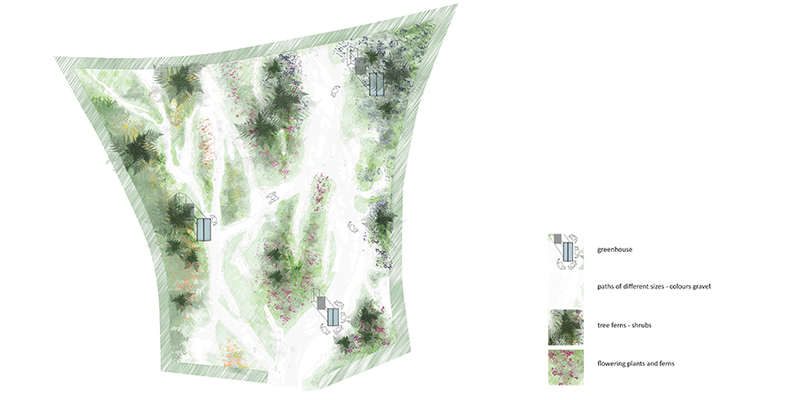 The fundamental of the garden is an extraordinary landscape. 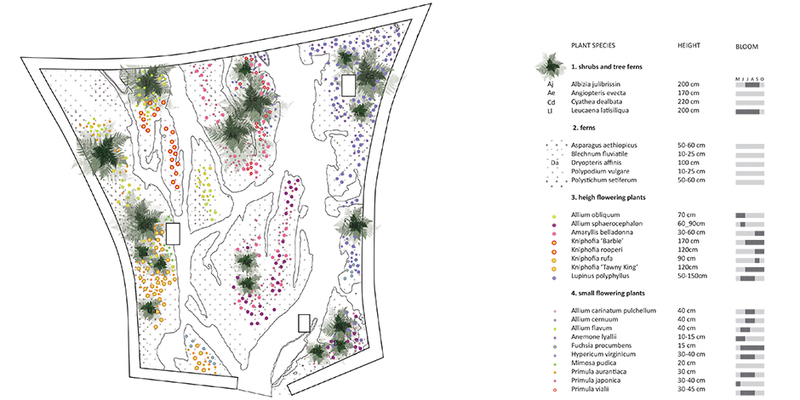 The floor of the plot consists of a rough surface planted with plants that refer to the different landscapes all over the world where these Plant Hunters have been. 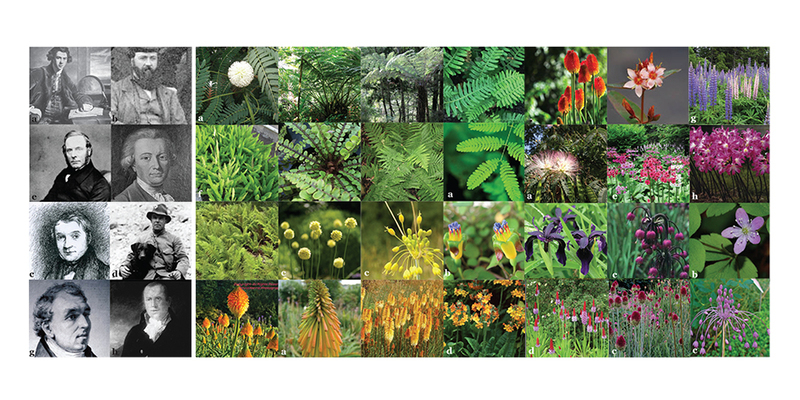 Most plants in the garden are specific introductions of plants by Plant Hunters in the 18th and 19th century. 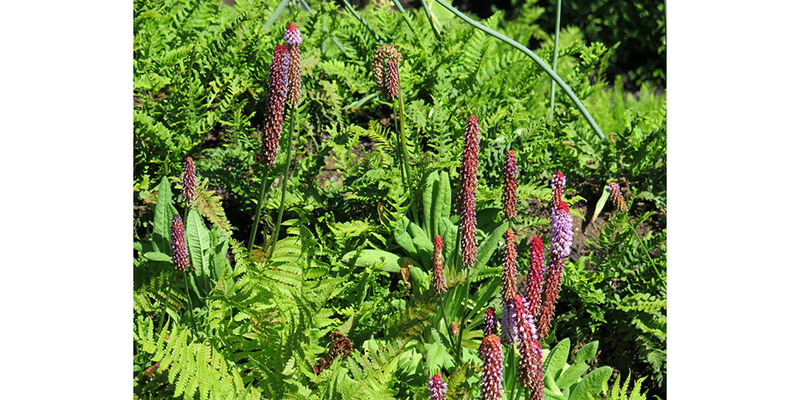 Like the Lupinus polyphyllus introduced by David Douglas, several unusual Allium-species brought here by George Don, the Kniphofia rufa which Sir Joseph Banks took with him from his travels with James Cook and the beautiful Anemone lyallii from David Lyallii. 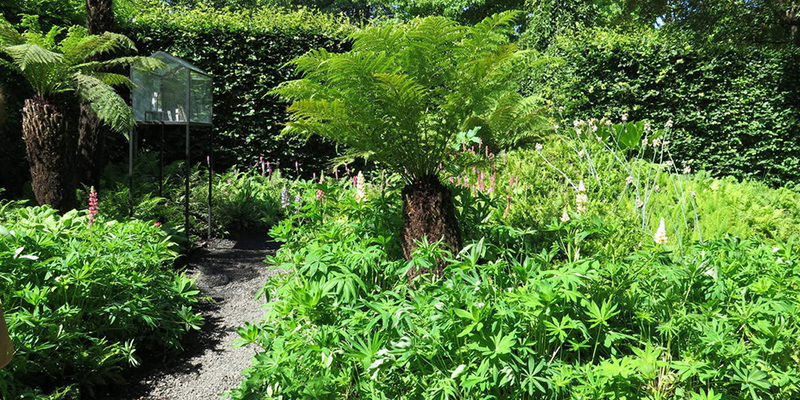 Small and big ferns are the base for the colourful plants and remind visitors of a mysterious world. 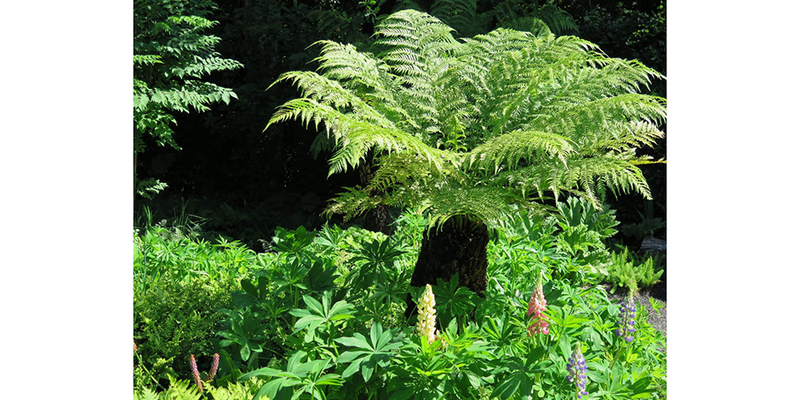 Between this fern shrubs and rare flowering plants are planted. Among this amazing world of plants we put three greenhouses witch symbol the presence of man in the undisturbed landscape. The greenhouses stand in the garden like really exquisite objects and tell the stories of these plant pioneers. We invite the visitors to come into our garden and feel like an real plant hunter discovering a new world. Everyone can choose their own trail through the plants. 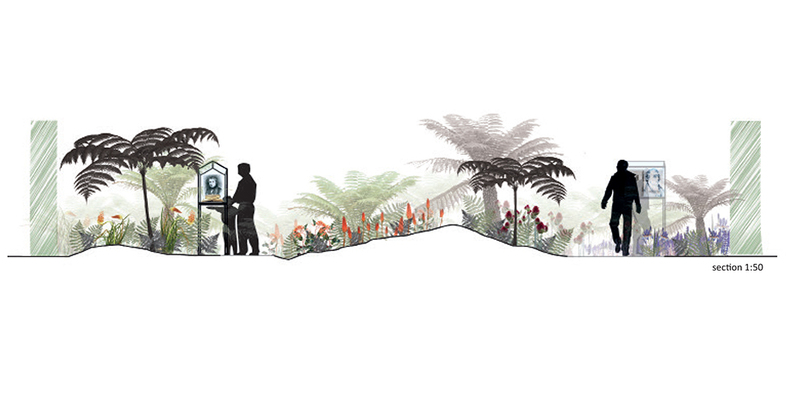 With our design we want to evoke the experience of exploring and the excitement of discovering a rare plant. Therefore the path is irregular and not always clear. Not every trail leads up to a specific target. True explorers have to have real perseverance and push through until they reach the one precious plant witch can make their collection more complete.